A few months ago, Life Fitness announced that they are making treadmills (and other machines) compatible with Nike+. That’s only a good thing if your gym uses these new Life Fitness machines. If you’re a member of 24 Hour Fitness, tracking your workouts just got easier. Beginning in July, select 24 Hour Fitness clubs in New York, San Francisco, Miami, Denver, Portland and Salt Lake City will begin receiving Nike iPod enabled gym equipment, just in time for members to use the new machines to prepare for and compete in the Nike Human Race on August 31, 2008. I KNEW there was a reason I kept my 24 Hour Fitness gym membership! I’m so lucky to be in one of the lucky cities where they are testing this new technology. All of a sudden I am excited about going to the gym again! 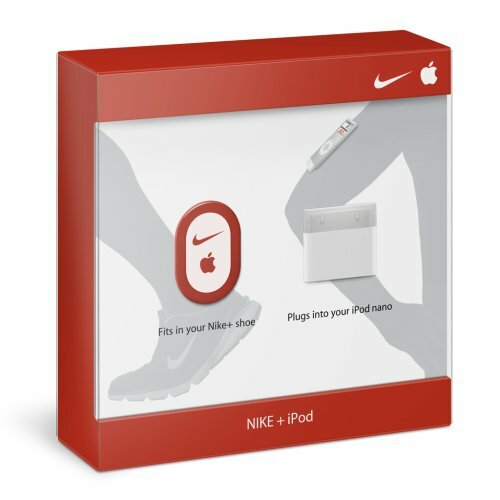 Starling Fitness Â» Ask Laura: Should I Buy a Nike+? If I had to choose one invention of 2006 that totally changed the way I exercised, it would be the Nike+. Knowing that Nike, Apple, Life Fitness AND 24 Hour Fitness are going to support this innovative program just makes me more happy. Do You Feel Like A Poseur? This comic from Least I Could Do really hit home for me. Sometimes I feel like a poseur. I have lost weight. I have gained weight. I have gotten my binges under control. I have let them get out of control. Right now, I’m not at my goal weight. I’m struggling just to eat healthy and exercise. Funny thing is, when I was nearly at my goal weight, I ALSO felt like a poseur. I felt like a fat girl inside my skinny body. Now I feel like a hypocrite writing about health and fitness when it’s a struggle every day just to play on the Wii Fit. Is it a no-win situation, or will I eventually be AND feel like a thin girl someday? Do You Feel Like A Cat On A Treadmill? How about you? Do you feel like a cat on a treadmill? Do your workouts feel like you’re forcing them every day? How can you avoid feeling like that white cat? I change my workouts quite regularly to keep things new. I have a hard time concentrating on one type of exercise, so I try everything that’s out there. I walk, run, ride my bike, play Dance Dance Revolution, use the Wii Fit and I even load up the old Yourself! Fitness every once and a while. Whenever it feels like a chore to exercise, I do something I haven’t tried in a while. Sometimes, even changing venue is enough. I might be running on the treadmill every day and it starts to feel like a chore, but then I go for a run outside and it feels different, even though I went the same distance. Next time you’re feeling like a cat on a treadmill, try something new. It just might be your new obsession. With gas prices approaching five dollars a gallon, it’s in your best interest to combine your workout with your errands. You’ll save gasoline, money, and time. Instead of driving to the gym to workout on the treadmill, you could walk to the grocery store for groceries. You’ll get your shopping AND your workout done in the time you would have spent working out. 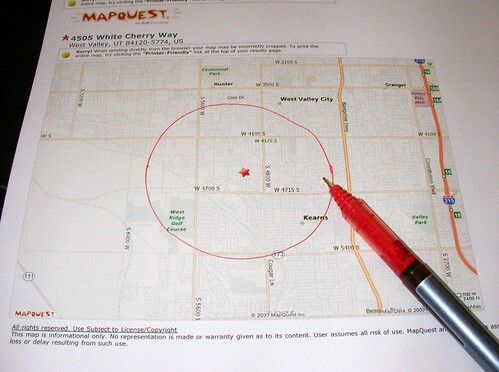 In that entry, I recommended a circle with a radius of 1.5 miles. If you are riding your bike, however, you can increase that radius to 3 miles and still be able to get your workout done in an hour. Once you have the circle on your map, find all the places within that area that you regularly go to. Instead of grabbing dinner at the restaurant and bringing it home, have the whole family walk to the restaurant. Instead of going for a drive to get out of the house, jump on your bike and see how far you can explore in an hour. With the economy the way it is, finding alternate ways of getting around is a good practice. 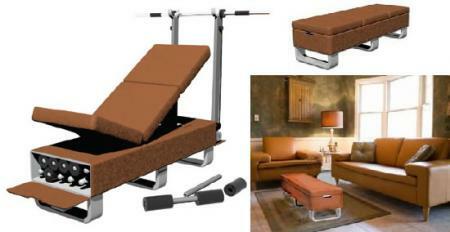 I live in a tiny 850 square foot house, so this weight bench looks like a dream come true to me. How possible is it to make this on my own? Could I “hack” my own weight bench and make an ottoman bench myself? Life Fitness, please make this bench. I know a ton of people who would buy it. Want To Lose Weight? Go Directly To Jail. It seems that the 3,000 calorie a day diet that the Arkansas jail provides for Broderick Lloyd Laswell isn’t enough for him to maintain his weight. Instead of being grateful that he is 100 pounds closer to a healthy weight, he is suing the county. At 3,000 calories a day, he might feel like he’s being “starved to death,” but that is nearly 1,000 calories more than the daily recommended average. I find it appalling that he is suing. People pay good money to go to places that will restrict their diet enough to lose 100 pounds. Usually when a supplement company is found guilty of violations, they are required to pay a fine. It appears that Metabolife founder, Michael J. Ellis, has been sentenced to six months in prison in addition to his fine of $20,000. In November 2007, Ellis pled guilty to federal charges of lying to the FDA. Metabolife’s ephedra-containing diet pills triggered thousands of complaints from customers who had experienced adverse effects. Yet in 1999, while the FDA was considering prohibitions, Ellis knowingly told the FDA that the company had a “claims free history.” The FDA later banned ephedra as an ingredient in dietary supplements. 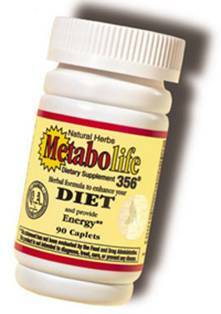 With Metabolife 356 as its flagship product, the company became one of the largest retailers of products marketed as dietary supplements. Ellis’s indictment, the FDA ban, hundreds of personal injury lawsuits, and falling sales due to adverse publicity led the company to file for Chapter 11 bankruptcy in 2005. Remember all those people who took ephedra and had heart problems because of it? The fact that Metabolife is out of business doesn’t change the fact that they still have heart problems. Next time you’re tempted to try a diet pill, remember Metabolife and save your money. That company might not be around when they find out how dangerous your supplement is. If you have ever watched The Biggest Loser, you know who Jillian Michaels is. She is the tough trainer who pushes her contestants to a win. In fact, last year, the two finalists for The Biggest Loser were both from her team. Majesco CEO Jesse Sutton said the title is aimed squarely at the growing casual gaming audience, especially women. He said exer-gaming should create a growing opportunity for fitness celebrities, especially those who already have make their mark on TV and DVD. I have really enjoyed working out with Wii Fit and it’s great to know that serious trainers are excited about it. I love to know that my Wii Fit balance board will be useful in games long after I’m sick of running on Wii Fit Island. Does Smoking Make You Thin? Reach for a Lucky instead of a sweet. Is it true? 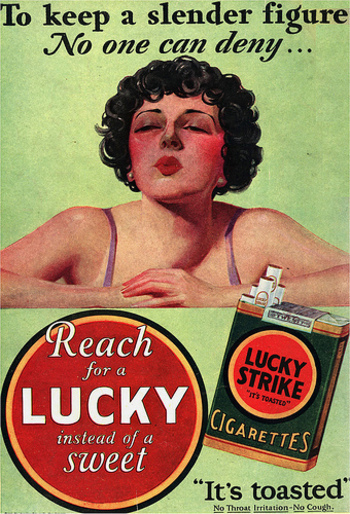 Does smoking make you thin? Researchers conducted the study on mice over seven weeks. Half the mice were exposed to smoke from four cigarettes a day for six days a week, while the other half were smoke free. The study found smokers lost muscle mass, which gave them the appearance of being thinner, but the fat instead was stored around their vital organs. I don’t know about clinical research, but I can tell you that when I was in college, I decided to try smoking to lose weight. I didn’t lose weight. I got bronchitis and I realized that if I kept smoking, I would feel like that ALL the time. So I quit. While I was quitting, I gained ten pounds. Smoking made me GAIN ten pounds. What about you? I remember my girlfriends telling me that if I just smoked, I would lose weight. Is it just me? Does ANYONE lose weight by taking up smoking? 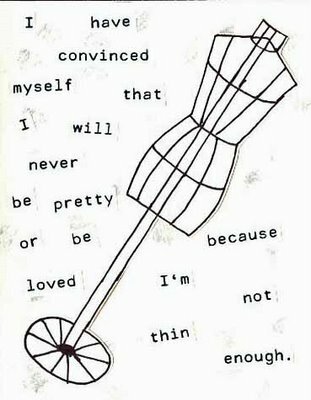 I have convinced myself that I will never be pretty or be loved because I am not thin enough. I have been willing to let myself be loved despite my physical appearance, but I am also convinced that I will never be pretty. I shrug and tell myself that being pretty isn’t as important as being smart, witty or kind. Sure, beauty is just one aspect of a beautiful person, but it’s a mighty important one, isn’t it? People will judge me within a couple of seconds based on appearance alone.